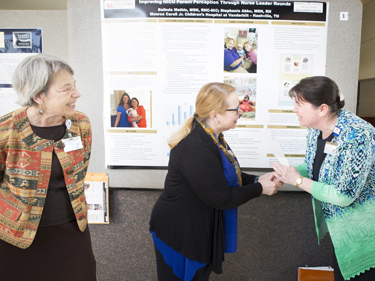 Nursing research took center stage in Light Hall recently during the Research Day Poster Presentations, organized by the Evidence-Based Practice (EBP) and Nursing Research Committee of Vanderbilt University Medical Center. Hundreds of Vanderbilt nurses, members of Sigma Theta Tau, Vanderbilt University School of Nursing (VUSN) faculty, students and others attended the annual event, part of Octoberfest 2016, four days devoted to evidence-based practice. Immediately afterward, people began filing by the 30 posters that were featured in the Light Hall lobby, showcasing a range of nursing research across the Medical Center. The top three posters received monetary awards from the Iota Chapter of nursing honor society Sigma Theta Tau, which was founded at VUSN in the 1920s. “We set out to create an effective, standardized approach to daily nurse leader rounding with the goals of integrating parents and families as improvement partners, measure and manage patient experience in real-time, and automate the process to ‘manage up’ staff members,” Mathis said. The research allowed psychiatric nurse educators and bedside nurses to partner with an emergency department nurse educator and a quality nurse to identify best practices for emergency response. The approach improved nurse confidence in dealing with medical emergencies. Walker’s research involved a room constructed in Vanderbilt Psychiatric hospital where patients could de-escalate. The room features surround-sound speakers, carpeted flooring, recliners, pillows, a giant mattress, an exercise mat, dimming lights and a serene décor. “There was a statistically significant reduction in symptoms from prior to after using the room,” Walker said. The theme of this year’s event was “De-Stress at Octoberfest.” There were discussions on burnout, compassion fatigue and how lifelong learning can help nurses survive and succeed. These sessions were paired with a wellness fair that included self-care events such as yoga, medical fitness, Know Your Numbers and workplace violence prevention.